After noticing that I’d bought rather a lot of Disney films lately, I decided to write about a few of them to plug the gaps between new releases. After the genuinely shocking news of Robin Williams’ untimely death, there seemed to be only one place to start, really. Robin Williams was, and will remain, a hero of mine, having grown up seeing and enjoying a whole bunch of his films like this one, Jumanji and Mrs. Doubtfire. As I “matured”, I found new admiration for him in classics like Good Morning, Vietnam, The Fisher King and Good Will Hunting as well as some of his more offbeat films like World’s Greatest Dad and Death to Smoochy. He was one of only a rare few who I found just as funny and entertaining as an adult as I did as a stupid kid. I think one of the main reasons for this was the fact that as a performer, the guy was fearless. Whilst most of us lose it when we hit our teens, he maintained a childlike manic energy and an absolute confidence in what he was doing throughout his career, making him engaging no matter what age you were. It seemed fitting to me to rewatch not only a real childhood favourite of mine, but reacquaint myself with what is sure to be one of the longest lasting components of the legacy of a uniquely funny and talented showman. After the runaway successes of The Little Mermaid and Beauty and the Beast, which both marked much needed changes in direction for the company, Disney relaxed and settled on adapting Arabian Nights for their next project, comforted that it didn’t have to bring in Mermaid numbers. What went on behind the scenes of Aladdin is interesting as they had basically completed the script and storyboards before being forced to chuck everything out and start over from scratch when then boss Jeffrey Katzenberg reportedly “hated” what he was shown. With cancellation looming, the team hired Ted Elliott and Terry Rossio to punch up the script and trim the fat. Aladdin tells the story of a young, kind-hearted street urchin (Scott Weinberg) who dreams of more than his life of crime and poverty allows. 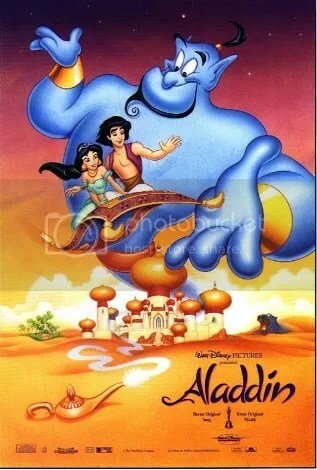 After he’s used and betrayed by the scheming advisor to the Sultan, Jafar (Jonathan Freeman), Aladdin stumbles across an old lamp and frees a magical genie (Robin Williams) who has the ability to grant him three wishes and the opportunity to improve both his stock in life and get closer to the Sultan’s daughter, Princess Jasmine (Linda Larkin). The plot is an amalgamation of all sorts of Arabian legends and fables. For the most part, it works. The screenplay is pretty smart in places. It was certainly a lot funnier than previous Disney efforts and I suspect Elliot, Rossio and Williams are the culprits. There’s more of an anarchic feeling to the humour, with several instances of fourth-wall breaking and the Genie’s impressions of people like Jack Nicholson and Rodney Dangerfield. I would argue that in this respect, Aladdin was kind of a trailblazer. A big celebrity voice actor, computer animation (for some background shots and for the intricate design on Carpet) and the generation-spanning humour appealing to both kids and adults etc. It’s the Dreamworks template, basically. Visually, the film’s a stunner. I love the art style. It’s bright and colourful with character designs taking inspiration from American caricaturist Al Hirschfield and his elegant, simple linework. All of these elements add up to something that’s loud, colourful and a lot of fun. I can see why my VHS tape stayed put in the VCR for so long when I was an ankle-biter. Story wise, it’s pretty solid. A lot of it is about people being true to themselves and various characters’ yearnings to be free of some kind of imprisonment- which is fair enough. The obligatory romance aspect is a bit thin, going through the standard Disney motions until the blah blah…”happily ever after” stuff. It has the same beats you’d expect, right down to a shared song implying mutual love. Having said that, it’s nice that Jasmine isn’t just the unattainable dream girl for our hero to work towards. She wants to be free from her father’s protection and from Draconian laws forcing her to marry within a certain immediate timeframe. Whilst they could have been a bit bolder with Princess Jasmine, it’s cool that she’s the one busting out of the palace, instead of staying put and waiting to be rescued like so many of her royal predecessors in the Disney stable. Linda Larkin does a good job of selling a tough character. Jonathan Freeman is deliciously evil as Jafar, making for one of the best Disney villains ever. His double act with the raucous parrot Iago (Gilbert Gottfried) is also massively entertaining. Aladdin himself is a bit of a square and looks like a mawkish ’80s sitcom character in fancy dress. He’s fine, I guess, but he’s hardly the most compelling hero we’ve had. It’s no secret that the film belongs to Robin Williams’ Genie. I mean, wow. I love the fact that they kept Williams’ improvisational nature when bringing the character to life, especially the opening with the (also Williams voiced) merchant. It’s impossible not to like Genie. The combination of the madcap, unhinged animation and Williams’ constant riffing and changing of voices works incredibly well. Genie’s “Friend Like Me” number encapsulates all of this perfectly and is easily one of my favourite Disney songs. In fact, all of the music is top quality. Aladdin continued the tradition of having big Broadway-style numbers (arguably) kicked off by The Little Mermaid. Alan Menken takes Howard Ashman and Tim Rice’s clever lyrics and puts them to catchy Arabian flavoured jazzy music and it works beautifully. Whilst it has the modern rep of being saccharine as anything and of being played at thick peoples’ weddings, “A Whole New World” is a great song in the context of the film. It’s lovely. There- I said it. So, I can’t really mark Aladdin down on too much. Aladdin is one of the first films I remember seeing at the cinema (the other coincidentally being Ferngully ) and I have watched it countless times since over the years. It’s a cherished early memory of the cinema coupled with a deep childhood affection. I am qualifying my bias here- I couldn’t be further from being objective if I tried. There is no way I can view it as an outsider looking in. Luckily, when rewatching it, I found that I had to forgive very little (some of the character designs are questionable, especially as Aladdin looks nigh-on Caucasian) and was swept along for the ride all over again. I hate to end on a rubbish pun, but I thought of the word and now I can’t get it out of my head- it’s magical.